We are looking at a list of the best cars under 10 lakhs in their respective segments. This should help you narrow down your search to 1 specific choice per segment, so whether you choose a hatchback or a sedan, we’ve got you covered. 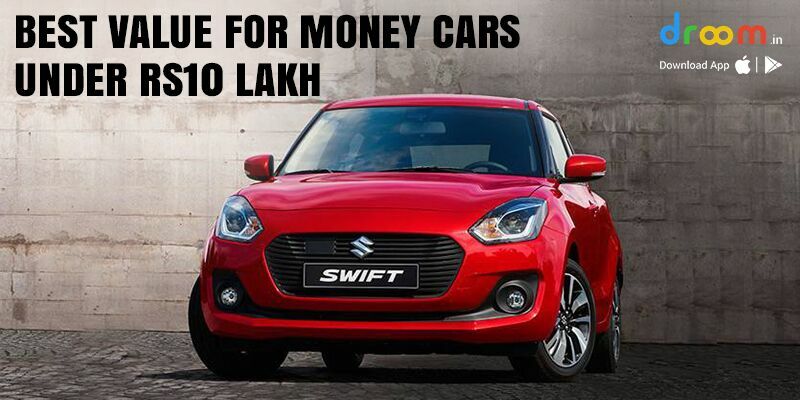 Maruti Swift: Maruti Suzuki really has amped up its styling game with even better fluidic and sporty designs. The new generation Swift has a balanced low stance, with sporty alloys, minimalist front grill, concealed door handles, liquid LED tail-lamps and so much more. The Petrol avatar handles smooth as butter being hooked to a 1.2 engine over the 5-speed manual box. Renault Kwid: The automatic is all good and well, but the 1.0 manual takes the cake. The Renault Kwid is tough, out-doorsy, feature-loaded entry-level Hatchback aimed at a younger generation of drivers. The 1.0 drives much better with the manual, raising performance and road control. The Kwid wins the entry-level hatchback segment simply through design. Hyundai Grand i10: Post its 1.2 diesel variant launch, the Grand i10 has seen considerable rise in sales in the segment, second only to the Maruti Swift. While the diesel variant really makes for good fuel economy, it is well matched by the petrol variant. This is the no-compromise stance of Hyundai at its best. Maruti Suzuki Baleno 1.3 Alpha: It is the bold, light-weight, powerful millennial premium hatchback on the market. The 1.3 diesel engine paired to a 5-speed transmission makes it the top dog of its class. The alpha model comes loaded with the latest Suzuki Connect and is a Nexa Premium vehicle. What’s more to say? Volkswagen Polo TSI: The 1.2 TSI engine of the Polo paired to a DSG autobox is the most sophisticated power car in the INR 10 Lakh bracket. The all efficient, all powerful German engineering of the fully AMT car makes the Polo TSI a really sweet ride. Ford Freestyle: Surprisingly, the Freestyle beats S-Cross for the best value-for-money Crossover in the market. Given its sweet pricing, the Freestyle comes mated to a powerful engine and is packed with sophisticated safety features and steering-mounted infotainment controls. This car is far from the facelift Figo it was expected to be. It’s the real deal. Maruti Dzire: The new Dzire is nothing short of a fully loaded compact sedan, the best of sedan cars in India below 10 lakhs. While not a part of the Nexa range of premium Maruti Vehicles, the Dzire comes well-stocked with features and gadgets and a whole lot of space. Just like every Maruti, fuel efficiency is its absolute cake. This is the best economy class family car on the market. Hyundai Creta E Plus: The Hyundai Creta is everyone’s all-time favourite compact SUV. The recent facelift has given it a much sportier vibe, followed by premium looking interiors and an amazing infotainment & stereo system. The added child safety features call for a massive thumbs-up as well.